I started running in 1977 to get in shape for track despite the fact that I was told by my allergist in elementary school that I would only be able to swim because I had asthma and required a controlled environment. Prior to February 1977 I only ran for a couple weeks to get in shape for basketball. I ran with my dad and complained the entire way....too long, too hot, too boring. Despite by initial objections, I had success on the track team, and when I was offered the opportunity to be part of the first girls' cross country at our school (think Title IX), I decided to give it a shot. I ran cross country and track for the next seven years and was fortunate enough to have coaches at the high school and college levels who knew how to balance high level training and racing with fun, giving me a life-long love for the sport. I am also grateful for a father who never let asthma be an excuse for inactivity. With 34 years of running under my belt (including running through one pregnancy and partway through another, 5 marathons in college and one at 45-plus, and many shorter races), I was starting to find myself injured every two years or so. I was coming off a calf injury in the fall of 2010 when my physical therapist suggested I try insoles and get fitted for shoes. Frustrated by places where I was treated like a second-class customer because I was not young, thin, and fast, I showed up at Fleet Feet Knoxville and was treated like an athlete. I was sold. Not long after getting fitted for shoes, I was talking with my younger brother in February 2011 about the reasonableness of continuing to compete with so many years of training and racing on my legs and he suggested triathlon. I told him no way; I had done two open water triathlons and two duathlons shortly after college and hated them - I thought I was going to drown while swimming and couldn't keep up with anyone on the bike. 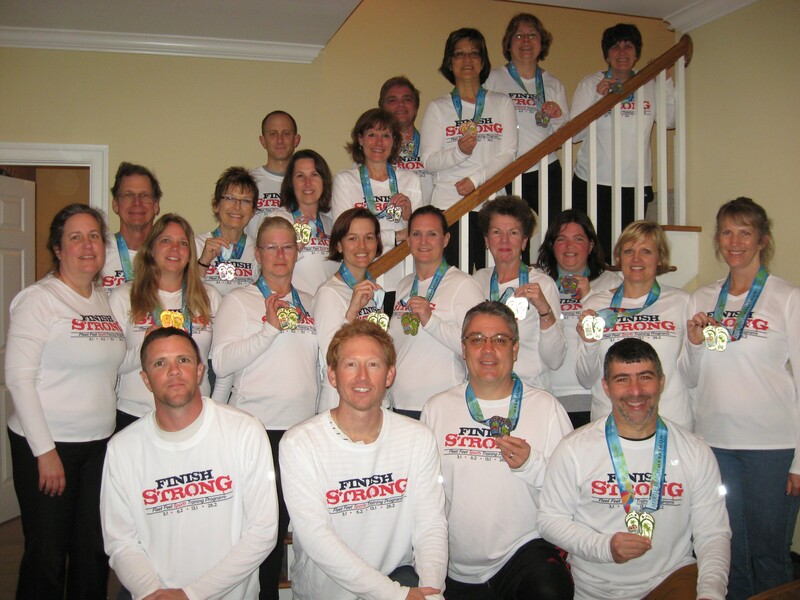 He had taken up triathlon two years prior and talked about how great it was to be able to train and race hard without the chronic pain or frequent injuries he dealt with when running. I had just seen a Fleet Feet Knoxville newsletter promoting Tri Training and despite my skepticism, joined. The Fleet Feet training programs have been amazing, which is why I keep coming back! I did not realize how much I missed working with a coach and training with a "team". There are so many things I love about the training programs, starting with the camaraderie and training with people who have similar goals and support me as I am working toward mine. My Fleet Feet training partners inspire me to keep at it, including those who are just starting and are excited by their ability to do what they never thought they could do, those who are training and racing at the grand masters plus level and helping me see what is possible in my next decade, those who enjoy the experience of racing and finishing without regard for finishing place or time, those who are seriously pursuing time or distance goals, and those who have finished distances that are only in my dreams. The challenge of training with a diverse group of athletes that includes people who are faster than me that has helped me to continue to push myself and improve. The instruction and focus on teaching and preparation in Fleet Feet training programs have also been great for me as an athlete. Shahin’s sensible and practical approach to training and his perspective on training and racing when the years of true PRs are well behind you have made a huge difference. The encouragement and support you get when training with the Fleet Feet coaches is invaluable. Case in point – Coach Paul Smith did ALL the long runs with me when I joined Fleet Feet Knoxville for Myrtle Beach Marathon training...telling me when to eat and drink while he kept me company and talked about teaching. When I was recovering from hamstring avulsion surgery and then later a fractured ankle, I could always count on Shahin’s random texts and emails to check on me. Cheryl has also been incredible; I love how she will just randomly show up in the middle of training with water, Nuun, gels, Gu, or a place to stash your stuff. In 2015, I qualified for Triathlon Age Group Nationals, and the experience was even better than I imagined. I nearly went to pieces over the opportunity to hear Mark Allen speak about his years in triathlon. I panicked during swim practice sessions the day before because the water was so I cold it took me 15 minutes to be able to maintain a consistent stroke or breathing pattern without gasping and having to stop and tread water. Worried, I called my brother (he lives in Michigan) and asked for advice. He suggested neoprene booties and a swim cap, which we found at a tri shop halfway across Milwaukee. Our dinner conversation was a verbal description of my race plans, especially for the swim, and I spent every sleepless minute of the night before visualizing how I was going to calmly manage the swim. Race morning was a delight. It was inspiring to meet and talk with people of all ages and ethnic backgrounds from across the country who love triathlon and competition. It was humbling just to start the race beside people who were aiming to qualify for the World Championship not just once, but for a second or third time. My own goals were much more moderate. I always set three goals for each race - one I better meet or I will be mad, one I would like to meet and will be satisfied with, and one that is beyond what I think I can actually do. I had looked at race results from previous years to think about reasonable time and place expectations for where I might finish out of the 170+ in my age group and was gaming for a 2:45-3:00 finish time. My "beyond my expectations" goal was to finish in the top half of competitors in my age group. As two women to my left talked about the hilly bike course (uh....not at all!) and two to my right reminisced about when they met at Nationals five years ago, I closed my eyes and walked through my race plans one more time. The competition, Fleet Feet preparation, great training partners, supportive husband, great weather, and flat fast course yielded a great day for racing. I finished 69th in my age group with a finish time of 2:50:45 (1:59 100 pace on the swim, 19.7 mph on the bike, and 9:07 min miles on the run). Not a PR, but I will take it. I never thought that less than three years after almost completely detaching my hamstring from my pelvis would I finish a half-Ironman and compete at age group Nationals in the same season. Many thanks to Shahin, Cheryl, and Fleet Feet Knoxville for making that possible. My future goals? To keep running as long as I am able. To enjoy the process. To balance my desire to compete and train with the demands of my age, life, and job. To do another half-Ironman. To get faster. To do a century ride. To still be running when I am 80. And maybe....to do a full Ironman...maybe.